G-Xchange, Inc. (GXI), a wholly-owned mobile commerce subsidiary of the leading telecommunications company in the Philippines, Globe Telecom, Inc. supports and joins The Asia Digital Marketing Expo, the biggest convention of leaders for Digital Marketing. The Asia Digital Marketing Expo 2015 will happen on July 26, 2015 at the SM Aura SMX Convention Center in Taguig from 8AM to 6PM. G-Xchange, Inc. (GXI), pioneered GCash, an internationally acclaimed micro payment service which transforms a mobile phone into a virtual wallet for secure, fast, convenient money transfers at the speed and cost of a text message. Earning various international awards such as GSMA Awards for the Best Mobile Messaging Service received in February 2015, Mobile News Asia’s Most Innovative Mobile Services and Global Messaging awards for Best M-Commerce Service application both received in June 2005, GXI continues to be a leader in innovation and provide ground-breaking business solutions to different sectors and make mobile money services more relevant to the growing market in the Philippines. 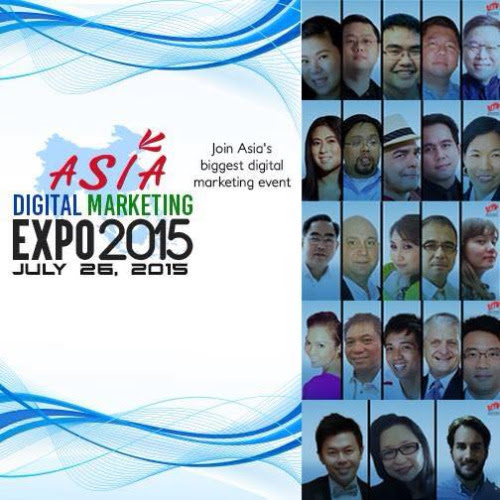 In this year’s Asia Digital Marketing Expo, headed by Engr. Grace Bondad Nicolas together with TAG Media and Public Relations, G-Xchange, Inc. (GXI) will be participating as its Lead Sponsor showcasing Globe Charge, GCash MasterCard and GCash American Express® Virtual Pay and how these products are contributing and transforming the future of online marketing in the Philippines. • Maria Camille Montejo- CEO, NWSteel Technologies & Tree Top Adventure Inc.